The weather forecast for Saturday was not promising – heavy rain and hail showers – but, as is often the case in Cornwall, the elements refused to conform. Instead we enjoyed sunshine, punctuated by the occasional, monumental downpour. We arrived at Bosvigo Hellebore Day slightly later than planned (there’s no hope of keeping to schedule with a baby in tow) and joined the queue for the plant sale. 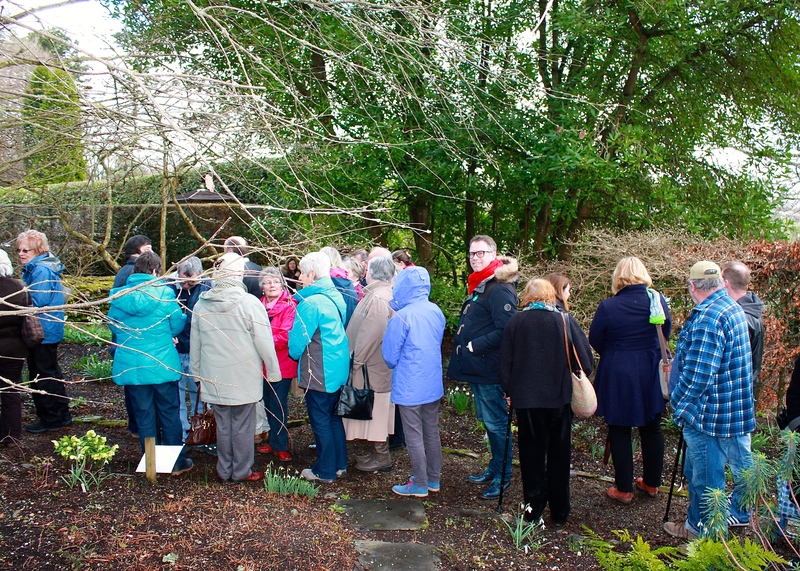 It was already forty strong, snaking back through Wendy Perry’s exquisite woodland garden in the centre of Truro. This is a special day when Wendy sells her surplus hellebore seedlings, the result of years of careful hybridisation and selection. Wendy’s garden is peppered with the fruits of her labours, exceptional hellebores with fine double and single flowers that she has decided to hold onto. Some have blooms that are slightly more upturned than usual, a feature Wendy looks for in a good plant. During February the hellebores are accompanied by drifts of snowdrops, chinodoxa and crocuses, protected by a canopy of colourful witch hazel. 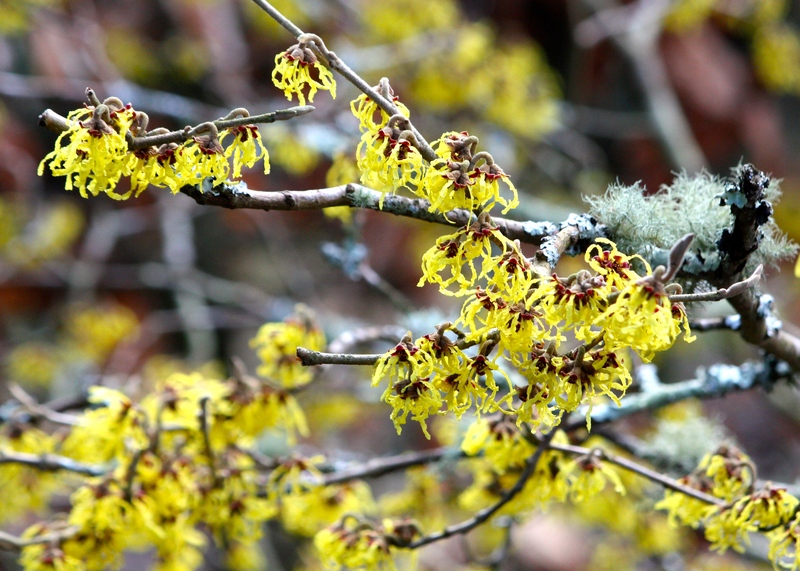 The fringed flowers of witch hazel always remind me of grated lemon zest. Bosvigo Hellebore Day is now well known in Cornwall, with folk travelling from every corner of the county to bag a prize specimen. I have to admit I did not enjoy the sale aspect of this year’s event: it was a bit of a scrum, with some people diving recklessly for the plants that caught their eye. Mostly there were just too many people for the confined nursery patch to hold comfortably. Regardless of that, there were some delectable plants on offer, the best of which were snapped up in minutes. A healthy turnout will have made for a good day’s takings, which support both the development of the garden and local charity ShelterBox. 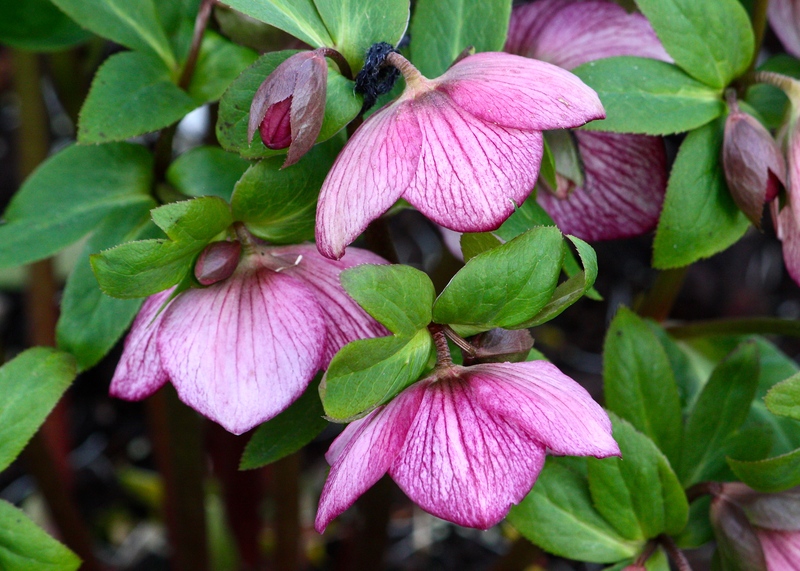 Maintaining as much decorum as I could, I settled on four beautiful plants; two dark-flowered doubles, one with an almost metallic sheen on the petals; a seedling with soft yellow flowers and golden nectaries, and a named variety, Helleborus ‘Penny’s Pink’. Having been lashed by gales today they will be making the journey back to London with me on the sleeper train tonight. I can’t offer them anywhere as salubrious to grow as Wendy’s picture-perfect garden, but knowing the quality of her plants they will light up our spring with heavenly blooms for many years to come. 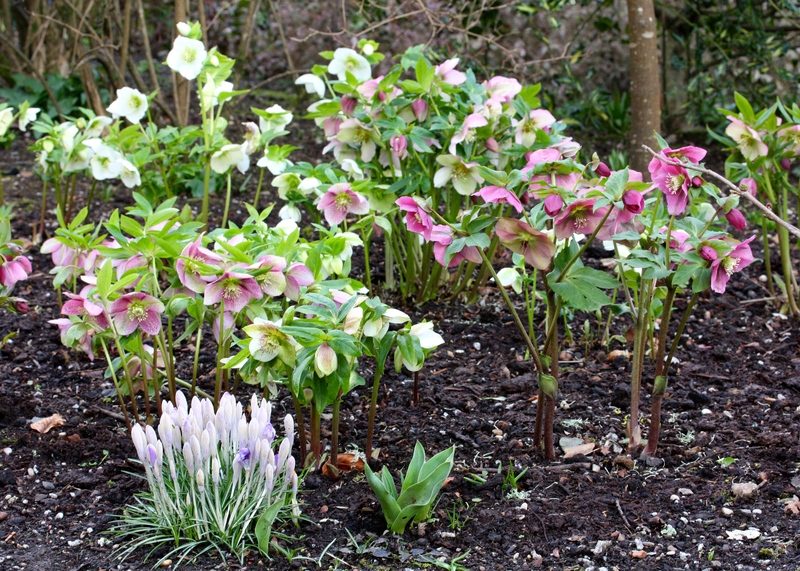 Hellebores mix well with snowdrops and crocuses. Blooming Bosvigo – how the woodland garden is transformed by a carpet of spring flowers in April. 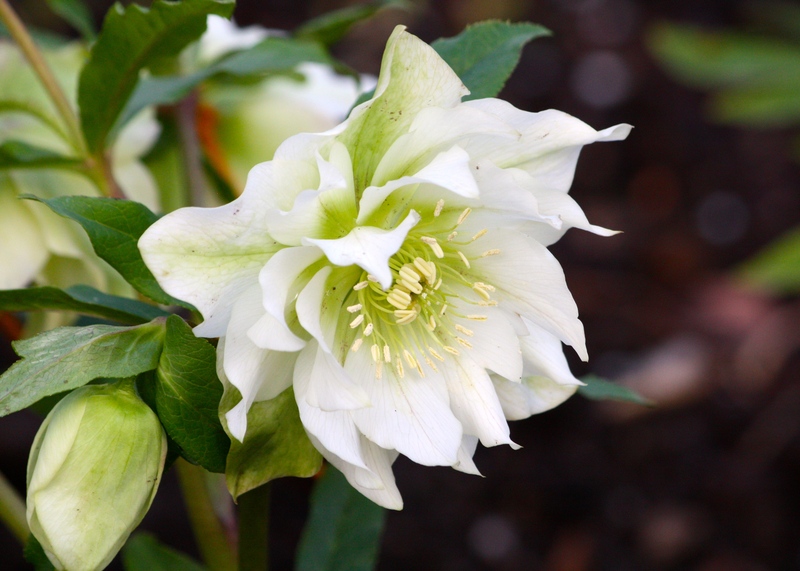 Plant Portraits: Helleborus x hybridus ‘Bosvigo Doubles’ – more about Wendy Perry’s double hellebore hybrids. 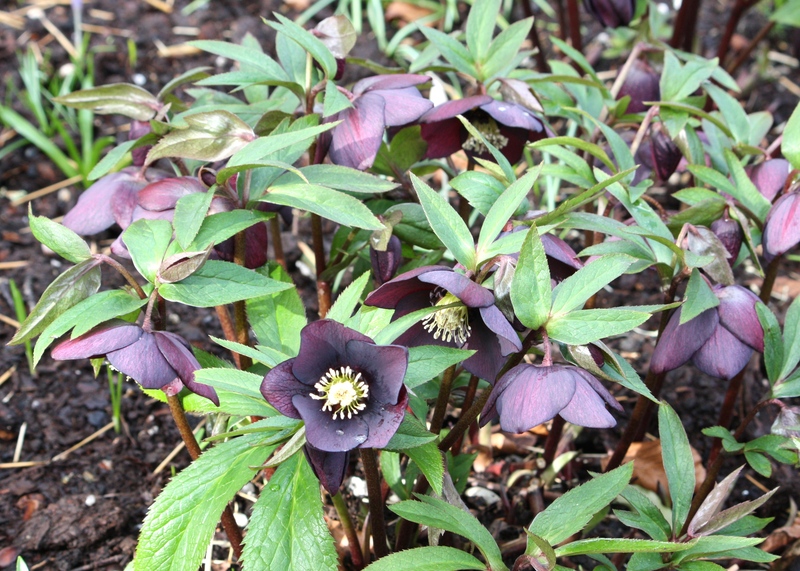 Bosvigo Hellebore Day 2014 – a post about last year’s Hellebore Day. 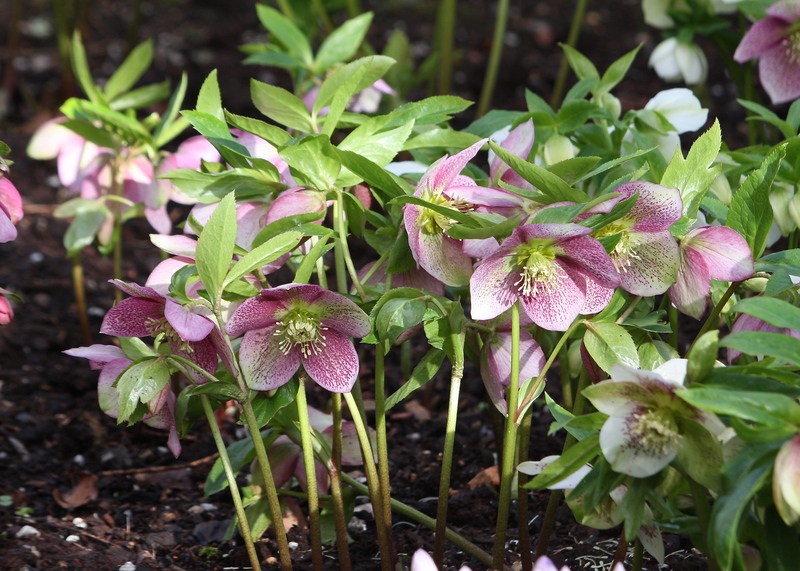 A Haven for Hellebores – an introduction to the gardens at Bosvigo. 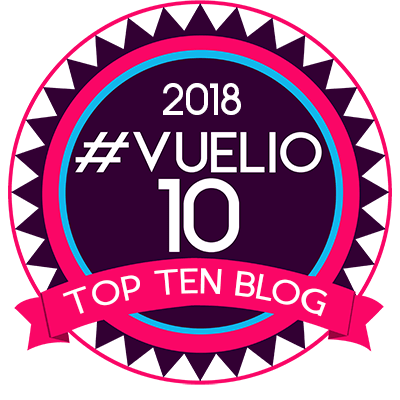 I remember your lovely post from last year on Bosvigo, Dan, sorry to hear this years event was a scrum. You look so jolly in the queue too and everyone else looks like they should know better! You read very well between the lines Julie. I think after one has started to turn grey (which includes me) lunging for anything looks unbecoming! Will you post some pictures of your new plants?? I certainly will, as soon as I get home! I will have to think of names for them too. Last year’s were named after desserts, so this year I will have to think of a new theme. I’m sorry Judy, it’s cruel of me, I know. If it makes you feel any better it was vile today. Horizontal rain. Yuk!! Ahh, I don’t envy you at all. I am hoping we may have escaped the white stuff altogether this year, but not counting my chickens! Gosh, it is exactly grated lemon zest. I shall never be able to look at witch hazel in the same way again! Love the hellebores too. 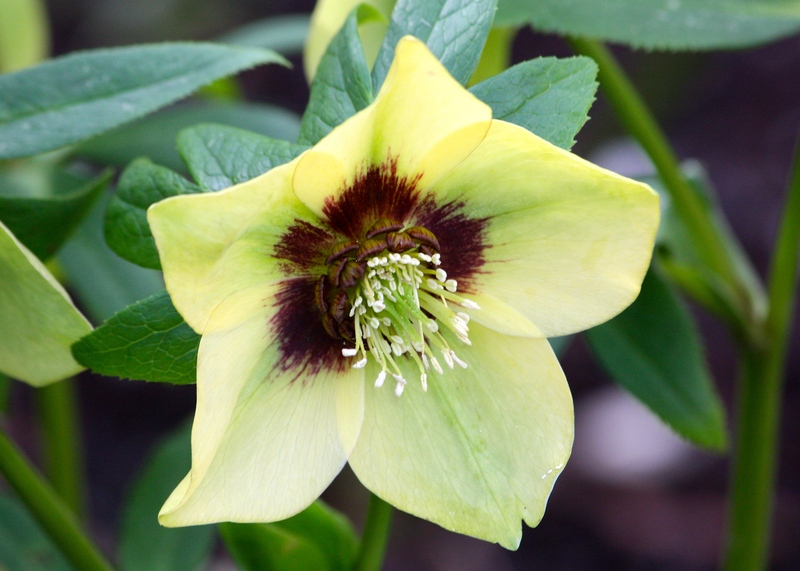 The yellow hellebore is exceptionally gorgeous! I’ll be interested to see, and hear the names of your purchases! I’m envious of your beautiful hellebores, but proud of my seed-raised witch-hazels, the only I know of in SA.